Sometimes you want to relax and pump up the tunes and still be able to take a phone call on your Galaxy S3 or other Android phone. NoiseHush makes all kinds of headsets, car kits, Bluetooth accessories and more. The NX26 is a full size over-the-ear stereo headphone that also fields your phone calls and lets you control your music like many smaller headsets. Right off the bat I will say that the NoiseHush NX26 HD is a contradiction; it is a full sized stereo headphone (think Beats, Grado or Sennheiser) that is made to work with your phone – Samsung Galaxy S III (S3,) HTC One X, iPhone – whatever – which plays compressed, non-high fidelity music. Back in the old days, full sized headphones were affectionately called “cans” and the good ones came from premium audio manufacturers. You plugged in the full sized headphone jack to your receiver (which had tubes and came from companies like Marrantz) and you listened to your vinyl records. The audio quality was amazing and your headphones literally enveloped you in sound. Today, most of use earbuds or in-ear earphones/headsets that provide a very different listening experience. Sometimes we can get high quality streaming music – but mostly we listen to compressed audio that loses some of that true high fidelity. 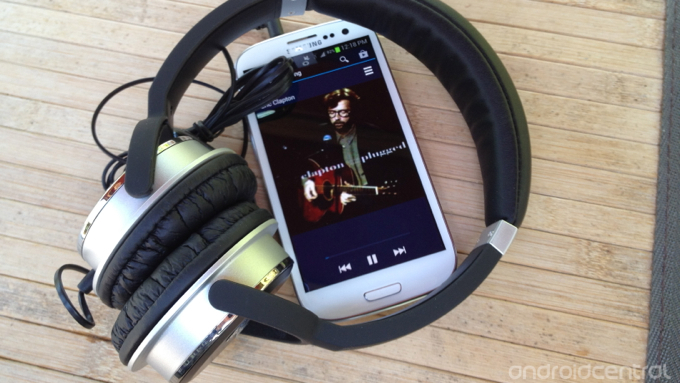 All that being said, I was very excited to try a full sized headphone with a microphone to use with my Galaxy S3. The NoiseHush NX26 comes in a nice box with just the headphones and a brief instructional manual. The NoiseHush NX26 are an over-the-ear set of headphones. They have an adjustable top headband to get a good fit on your head. They also are designed with soft ear cushions that sit on your ears and swivel in the brackets to give the perfect fit. The sound comes from Neodymium magnetic drivers which, obviously, are much more substantial than the little drivers found in most earphones. Attached to the left ear-cup is the cord – a non tangling but think wire with an acoustically tuned, noise cancelling microphone with a Function button to take calls, initiate voice dialing and control music. The NoiseHush NX26 is both headset for taking and receiving calls and a stereo headphone for listening to music. Push to take a call and again to end the call. 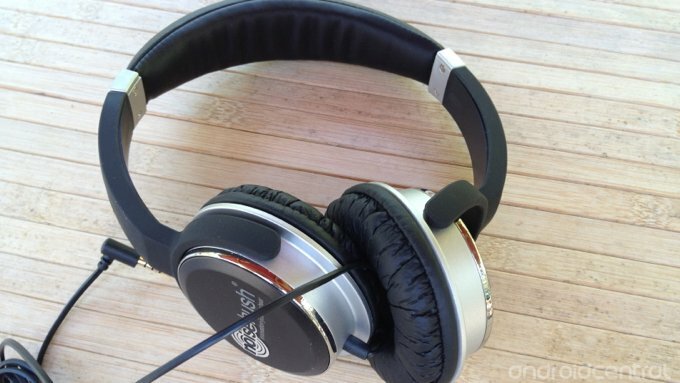 As I mentioned, the NoiseHush NX26 are a full sized over-the-ear pair of headphones. If you have never worn full sized headphones before, it takes some getting used to. There is definitely some pressure on the outer ear with these headphones. The adjustable headband was good to try to get a comfortable fit, ,but these are a pretty “tight” fitting headphone with more pressure on my outer ear than others I have tried. The ear cups themselves are very soft and comfortable and the headband has a good amount of padding as well. The microphone for the NoiseHush NX26 is right next to the Function button – hanging down from the cord. Call quality was fine on my end – it was actually quite loud coming through these headphones. Callers on the other end said they could hear my voice clearly, but it sounded a bit muddied as opposed to when I spoke straight into the phone. I have had some nice full sized headphones over the years. My Sennheiser’s, Audio Technica’s, Grado’s and Klipsch headphones all have a very different sound signature and all have excellent sound quality. I was hoping that, while not quite as expensive, these NoiseHush NX26’s could be put in the same category – but they can’t. With most full sized headphones, the bass is crisp and punchy and the mids and highs really make you feel like you are enveloped in music. Unfortunately, that was not the experience with the NoiseHush NX26’s. That is not to say that the sound was bad, it just wasn’t great. The bass is strong, but not as strong as I would expect from a headphone with large drivers like this. Where the sound really fell apart was in the high end. Cymbals were just not crisp, high notes on the guitar or piano were not as clear as they should have been and vocals in the upper register just did not pop the way they should. I tried all sorts of music from Springsteen to Santana to George Winston to Aerosmith and Branford Marsalis. No matter which genre of music I tried I was left feeling a bit “empty” not getting the enveloping experience that good headphones give you – the illusion that the sound is inside your head and all around. On the Galaxy S3, I played with the various EQ settings, adjusted the bass boost and the 3D sound settings, but it really didn’t help the overall sound quality. The NoiseHush NX26 is a relatively low cost full size headphone with the ability to also use it as a headset. If you don’t like putting ear buds into your ear canals or you have the type of ears that make it hard to get anything to stay, the NX26 offers a good alternative. They are certainly comfortable and can be worn for long periods of time. Call quality was fine on both ends. Where these fall short is in the area that, for me, is most important in a full sized headphone – musical sound quality. Most comparably prices in-ear headphones offer better sound quality than these full sized on-the-ear headphones. The NoiseHush NX26 is not for everyone. Most users will be better off with an equally priced or even less expensive set of in-ear ear buds. If you can’t stand to have things in your ears and like a bigger, full sized headphone and want to be able to field phone calls – these might work for you.